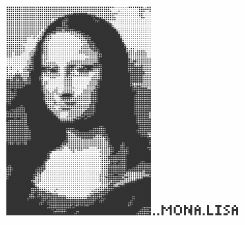 Cloned from Mona Lisa by ^.^. This serves as a spot light to a bit of work by a user named "^.^" I've tried to see this person's profile, but the account seems to be closed. If you want to rate this "font" I'd suggest you go click the original and rate that instead. This amazing bit of work deserves a second look. Its far bigger than anything I've ever done and is the original inspiration behind a lot of my work. Info: Created on 24th September 2014 . Last edited on 24th September 2014.